Orléans has two train stations. The one in the city center is probably the one you want. Orléans has two train stations, the Gare d'Orléans SNCF in the city center (sometimes called the Gare d'Orléans - Centre), and the Gare des Aubrais - Orléans SNCF, 2.6 km (1.6 miles) to the north (map). TER trains connect Paris's Gare d'Austerlitz with both Orléans train stations in about 110 minutes, stopping at numerous towns along the way. Intercité trains run nonstop from Paris's Gare d'Austerlitz to both Orléans stations in about 90 minutes. In Orléans you can connect with TER Interloire regional trains to reach other cities and towns of the Loire Valley (see below). TER Interloire regional trains run all the way from the Atlantic coast at Le Croisic via Nantes, Angers, Saumur and Tours to Orléans, connecting with local trains to Amboise, Beaugency, Blois—Chambord and Langeais. Ouibus, isilines and eurolines intercity buses connect Orléans with other cities in France and Europe. It's only 1.2 km (3/4 mile, 18 minutes' walk) from the Gare d'Orléans to the Pont George V over the Loire River, so Orléans is a fine city to explore on foot. The north-south tram Ligne A is useful for travel from the Gare d'Orléans south along the rue de la Républic to the central place du Général de Gaulle and beyond to the Pont George V over the Loire River. With Paris and its airports only an hour away by train, Orléans does not have significant air traffic. The Aéroport du Loiret — Orléans - Saint-Denis-de-l'Hôtel is a general aviation airport without scheduled flights. Gare d'Orléans SNCF in the city center. 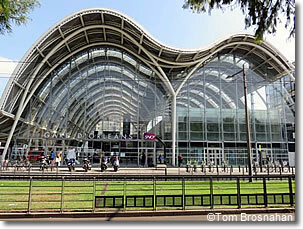 The former station, heavily damaged in World War II, was replaced by this dramatic, attractive structure.